Thanks to motnovak for the clip. 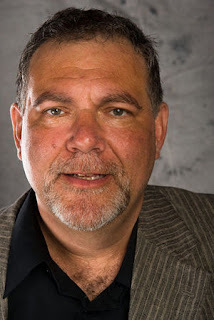 Robert "Bob" Guskind (photo by Hugh Crawford), whose sudden and untimely death yesterday has stunned the Brooklyn blogging community, was one of my first acquaintances in the world of on-line journalism. His blog, Gowanus Lounge (unfortunately not now available on-line, though I understand friends of Bob's are working on restoring it) covered the Brooklyn scene extensively, focusing on issues of land use and development but also ranging into other topics. Only the Blog Knows Brooklyn has provided a transcript of Bob's first post on Gowanus Lounge. Update: Gowanus Lounge is on line again (though it's getting so many hits now that you may have trouble connecting). I first met Bob at the 2007 Brooklyn Blogfest, when S-AB was just over a year old. After we met, he began to link to S-AB in his "Brooklinks" postings, which proved very helpful in getting new visitors to my blog. Update: Here are reminiscences by Bob's former colleagues at Curbed. Good, at least for those of us living in The Big Apple, or those planning to visit here. Update: Alas, news on the NYC crime front isn't entirely positive.